United Safety’s QA/QC process, called QCycle™ can greatly reduce the amount of equipment required as it is cycled much more efficiently and used multiple times per shift. Less equipment combined with reduced lost or damaged equipment, reduces costs. Clean and problem free equipment increases worker confidence in equipment, improving morale. There is an increased efficiency in the process of delivery and retrieval resulting in increased tool time as no one waits for equipment. Before our equipment leaves our onsite QCycle™ facilities it has been thoroughly cleaned, readied, and inspected. Your personnel will trust our equipment, and we will need to bring less as we can turn it around for re-use more quickly. 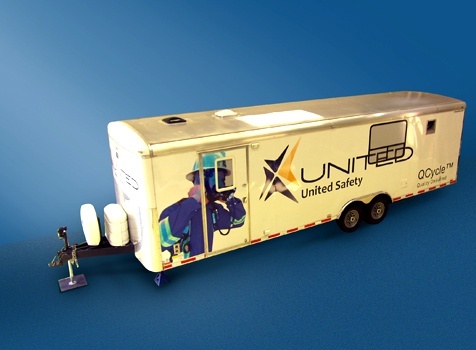 Distribution is a key partner to United Safety’s QCycle™ process. United Safety can manage the staging, delivery, and retrieval of safety equipment required for permitted activities; learn more about SiteCourier™, United Safety’s revolutionary way to distribute safety resources during a turnaround. United Safety can custom-design the distribution and QCycle™ process to meet the scope and requirements of your turnaround. This system can also generate utilization per shift reports, offering a real-time insight into workflow during the turnaround. Further, this effective inventory control results in zero shrinkage and a loss & damage report. See for yourself how QCycle™ can revolutionize how equipment is maintained. Request a workshop here.